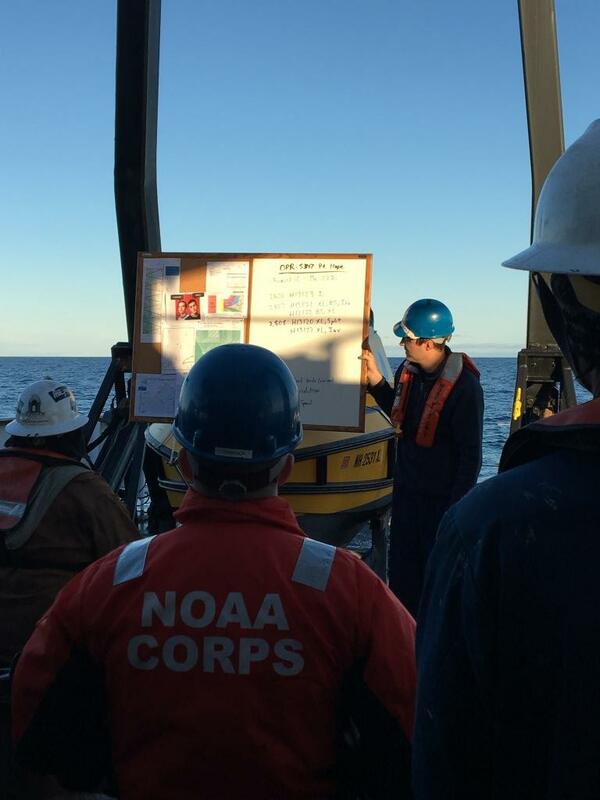 Why is NOAA taking on this challenging task of mapping the ocean floor? As mentioned in an earlier blog, the ocean temperatures worldwide are warming and thus the ice in the polar regions are melting. As the ice melts, it provides mariners with an option to sail north of Canada, avoiding the Panama Canal. 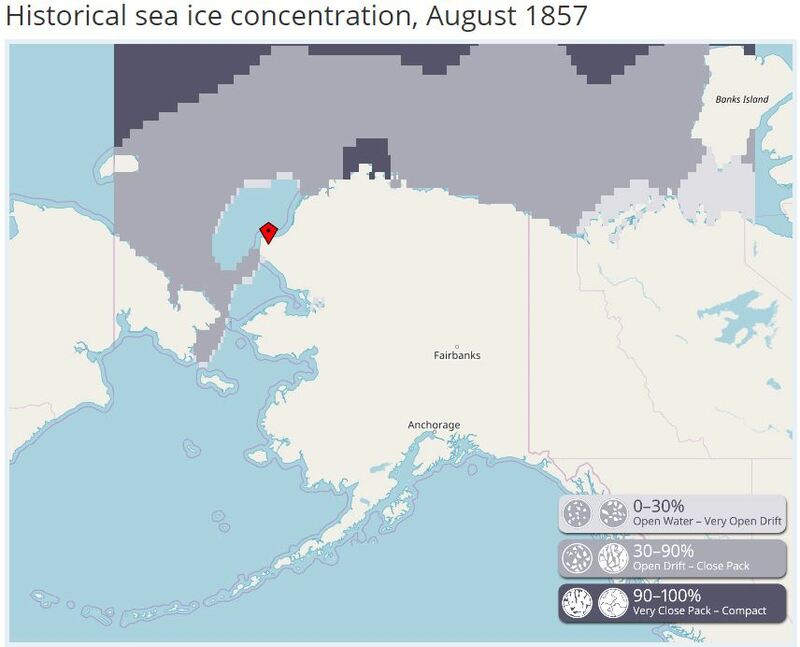 The following sequence of maps illustrates a historical perspective of receding ice sheet off the coast of Alaska since August 1857. The red reference point on the map indicates the Point Hope region of Alaska we are mapping. This data was compiled by NOAA using 10 different sources. 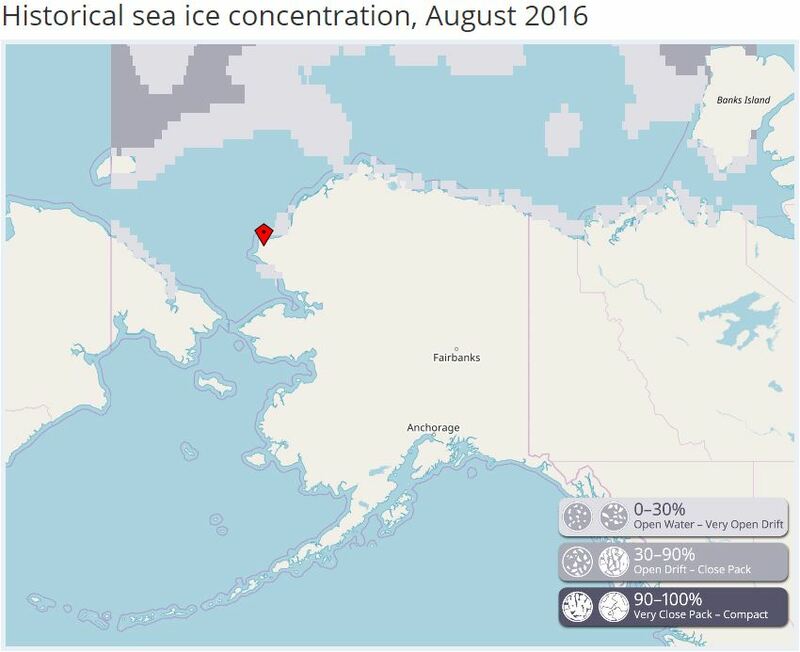 For further information as how this data was compiled visit https://oceanservice.noaa.gov/news/mar14/alaska-sea-ice.html. The light grey indicates 0-30% Open Water – Very Open Drift. The medium grey indicates 30 – 90 % Open drift – Close Pack. The black indicates 90 – 100% very close compact. Ships that sail this region today rely on their own ships sonar for navigating around nautical hazards and this may not be as reliable especially if the ships sonar is not properly working (it’s also problematic because it only tells you how deep it is at the ship’s current location – a sonar won’t tell you if an uncharted hazard is just in front of the ship). Prior to mapping the ocean floor in any coastal region, it requires a year of planning in identifying the exact corridors to be mapped. 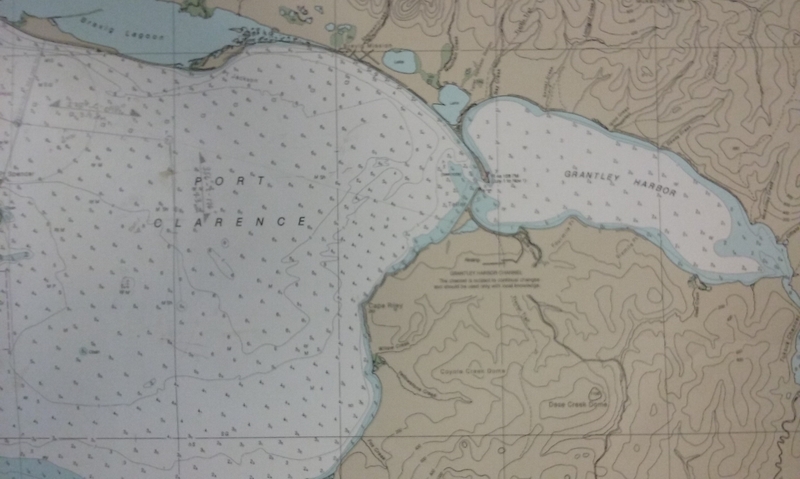 Hydrographers plot areas to be mapped using reference polygons overlaid on existing nautical charts. Nautical charts present a wealth of existing information such as ocean depth, measured in fathoms(one fathom is equal to six feet) and other known navigation hazards. As mariners sail closer to the shorelines, the depth of the ocean becomes increasingly important. Because of this uncertainty in the depth, the Fairweather herself cannot safely navigate safely (or survey) close to shore. In order to capture this data, small boats called “launches” are used. There are a total of four launch boats that are housed on the boat deck of the Fairweather. 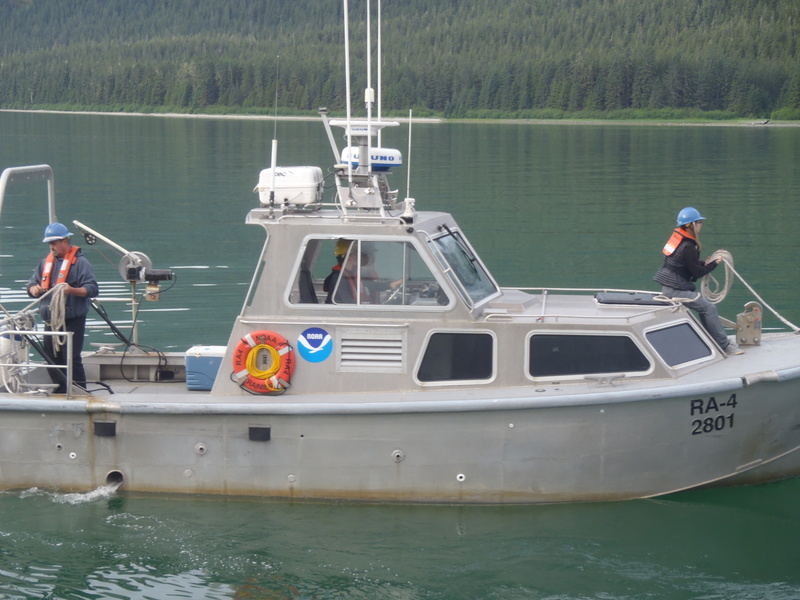 Each boat can collect data for up to twelve hours with a crew of 2-5. Depending on the complexity of the area, each daily assignment will be adjusted to reasonably reflect what can be accomplished in one day by a single launch. Weather is a huge factor in the team’s ability to safely collect data. 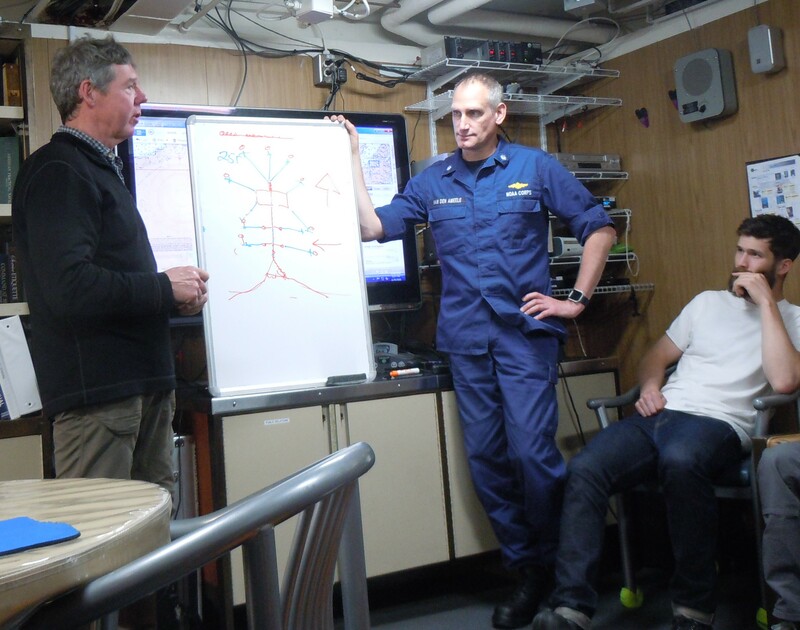 Prior to deployment, a mission and safety briefing is presented on the stern of the ship by the Operations Officer. During this time, each boat coxswain generates and reports back to the operations officer their GAR score (safety rating) based on weather, crew skills and mission complexity (GAR stands for Green-Amber-Red … green means low risk, so go ahead, amber means medium risk, proceed with caution; red means high risk, stop what you’re doing). In addition, a mission briefing is discussed outlining the exact area in which data will be collected and identified goals. 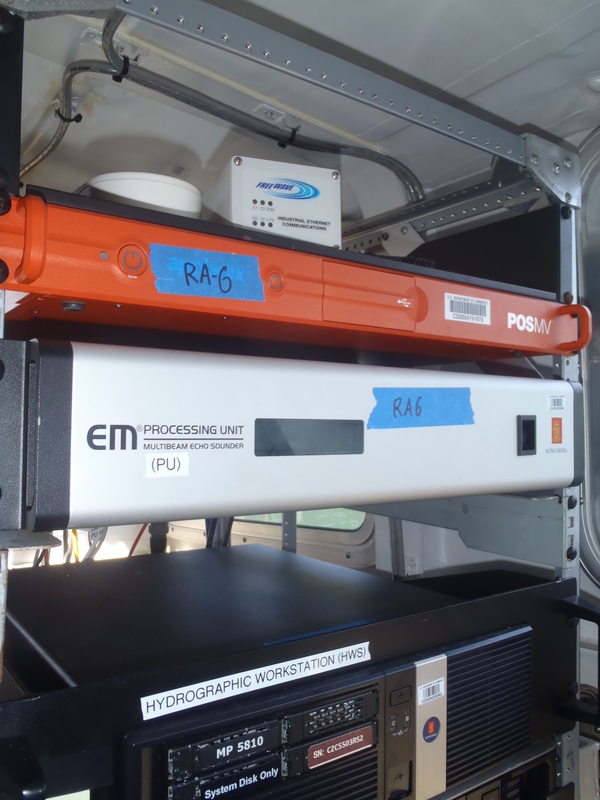 The sonar equipment that transmits from the launch boats is called EM2040 multi beam sonar. A multi beam sonar is a device that transmits sound waves to determine the depth of the ocean. 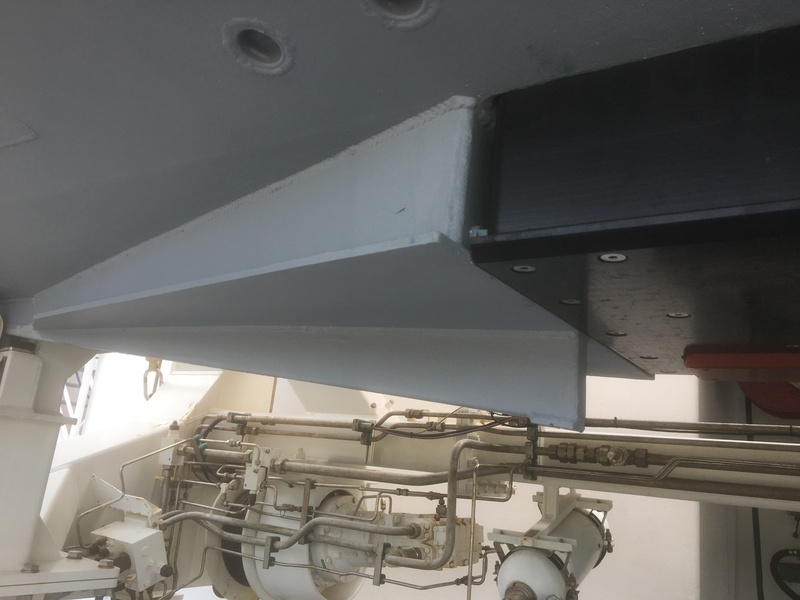 It is bolted to the hull that runs parallel to the boat, yet emits sound perpendicular to the orientation of the sonar. 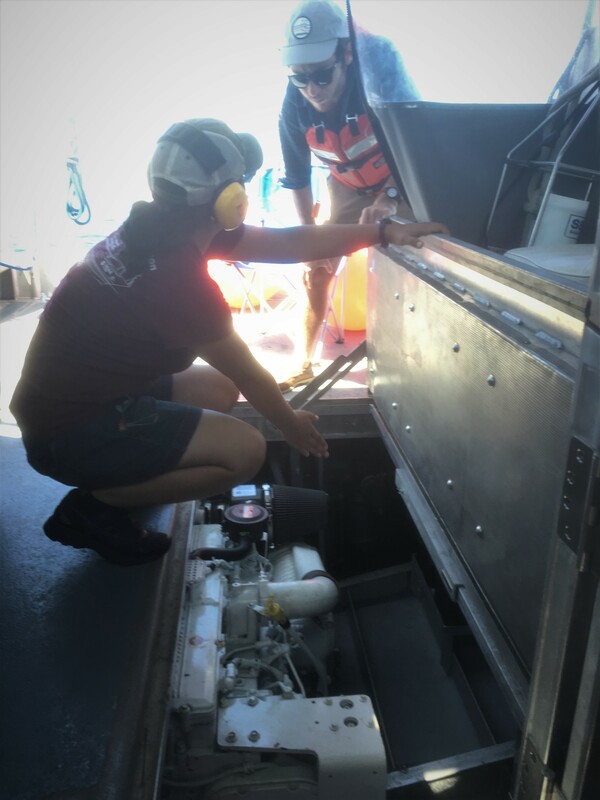 In the beginning of the season, hydrographers perform a patch test where they measure the offsets from the sonar to the boat’s GPS antenna, as well as calculating any angular misalignments in pitch, roll or yaw. These measurements are then entered in to software that automatically corrects for these offsets. 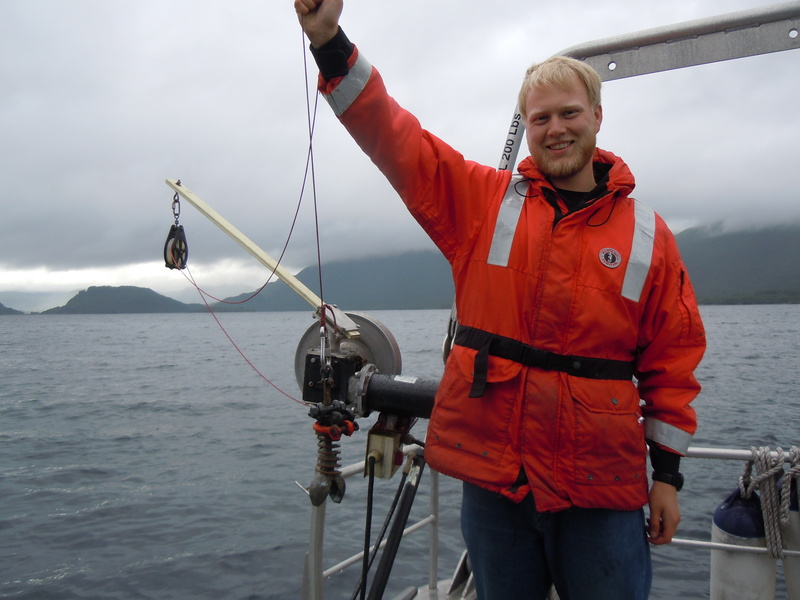 The first measurement to collect is the ocean’s conductivity, temperature and depth. From this information, the scientists can determine the depths in which the density of the water changes. This data is used to calculate and correct for the change in speed of sound in a given water column and thus provide clean data. The boats travel in pre-defined set lines within a defined polygon showing the identified corridor to be collected. Just like mowing a lawn, the boat will travel back and forth traveling along these lines. The pilot of the boat called the Coxswain, uses a computer aided mapping in which they can see these set lines in real time while the boat moves. This is an extremely valuable piece of information while driving the boat especially when the seas are rough. The coxswain will navigate the boat to the position where data collection will begin inside a defined polygon. Since the multibeam echosounder transmits sound waves to travel through a deep column of water, the area covered by the beam is wide and takes longer to collect. 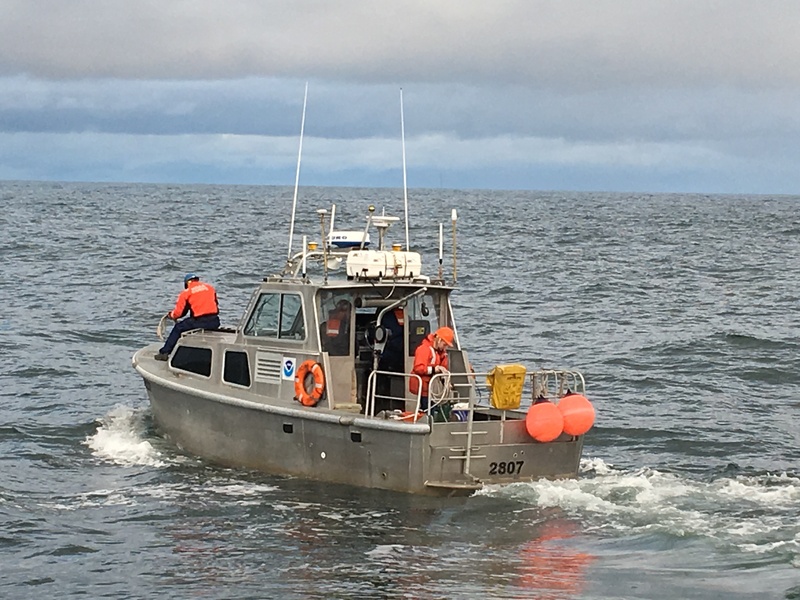 In such stretches of water, the boat is crawling forward to get the desired amount of pings from the bottom needed to produce quality hydrographic data. The reverse is true when the boat is traveling in shallow water. The beam is very narrow, and the boat is able to move at a relatively fast pace. The boat is constantly rolling and pitching as it travels along the area. 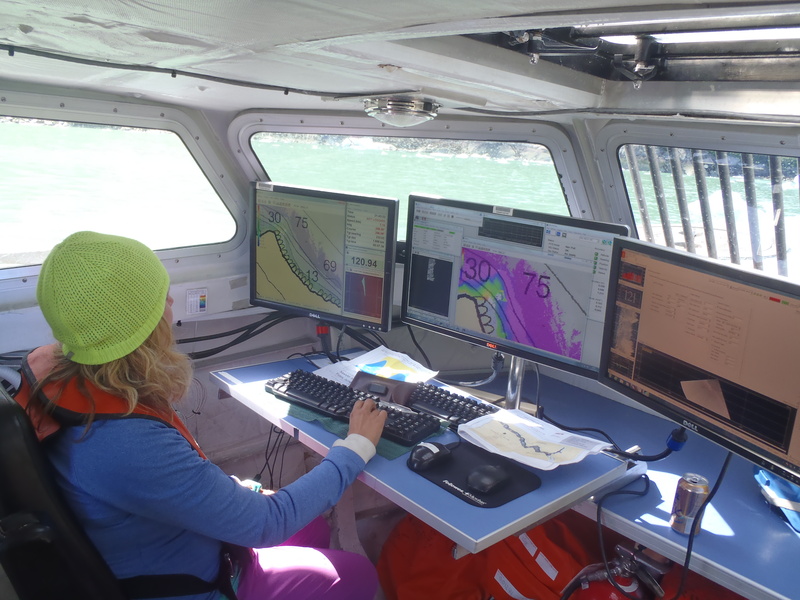 As the boat is moving and collecting data, the hydrographer checks the course and quality of the data in real time. The depth and soundings comes back in different colors indicating depth. There is at least four different software programs all talking to one another at the same time. If at any point one component stops working, the boat is stopped and the problem is corrected. The technology driving this collection effort is truly state of the art and it all has to operate correctly, not an easy feat. Every day is different and provides different challenges making this line of work interesting. Troubleshooting problems and the ability to work as a team is crucial for mission success! I have found the work on the Fairweather to be extremely interesting. The crew onboard has been exceptional in offering their insights and knowledge regarding everything from ship operations to their responsibilities. Today’s blog marks my first week aboard and everyday something new and different is occurring. I look forward in developing new lesson plans and activities for my elementary outreach program. Prior to arriving, I was expecting the weather to be mostly overcast and rainy most of the time. However, this has not been the case. Clear blue skies has prevailed most days; in fact I have seen more sun while on the Fairweather than back home in Hendersonville in the entire month of July! For my earth science students, can you make a hypothesis as to why clear skies has prevailed here? Hint, what are the five lifting mechanisms that generate instability in the atmosphere and which one(s) are dominant in this region of Alaska? 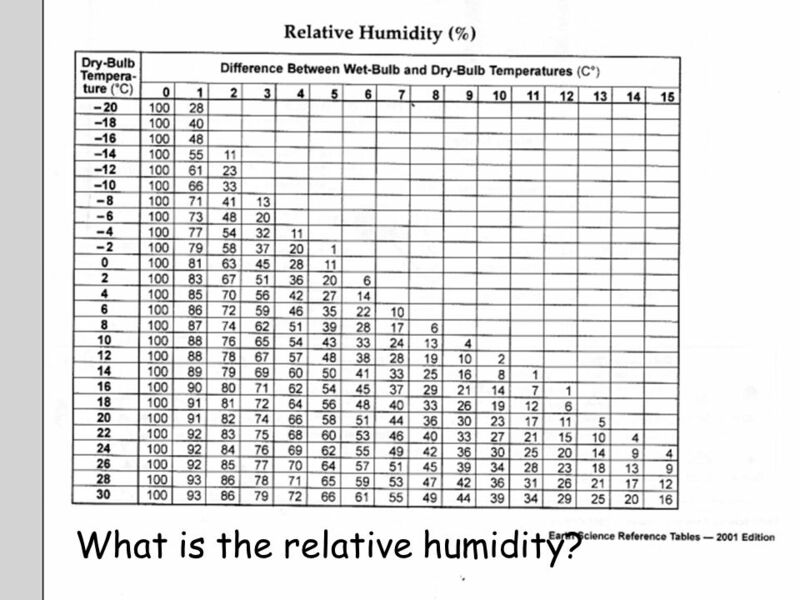 What is the relative humidity? My last few days at sea were rather exciting. Wednesday, I got to attend some medical training necessary at sea in the morning, and then in the afternoon we practiced safety drills. 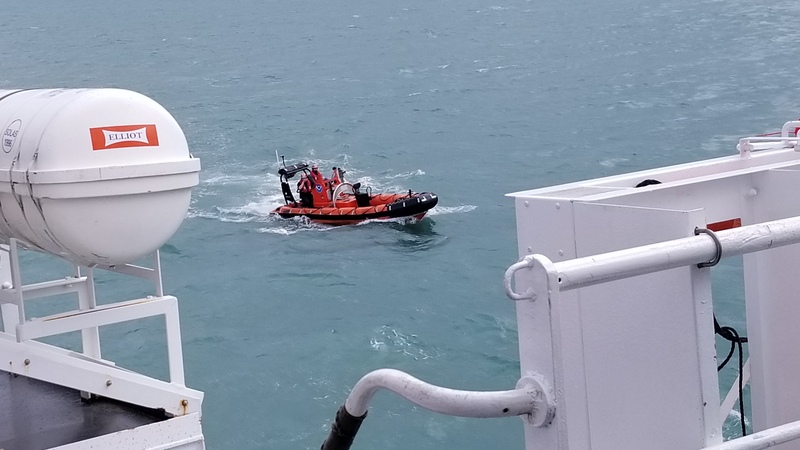 The whole crew ran through what to do in the case of three different ship emergencies: Fire, Abandon Ship and Man Overboard. These drills were pretty life-like, they had a fog machine which they use to simulate smoke for the fire drill. Once the alarm was triggered people gather in their assigned areas; roll was taken, firemen and women suited up and headed to the location where smoke was detected, and from there teams are sent out to assess damage or spreading of the fire, while medical personnel stood prepared for any assistance needed. The abandon ship drill required all men and women on board to acquire their life preserver and full immersion suit, and head to their lifeboat loading locations. Roll is then taken and an appointed recorder jots down the last location of the ship. Once this is done, men and women would have deployed the life rafts and boarded (luckily we did not have to). And for the man overboard drill they threw their beloved mannequin Oscar overboard in a life vest and had everyone aboard practice getting in their look out positions. Once Oscar was spotted, they turned the ship around, deployed an emergency boat and had a rescue swimmer retrieve him. Deployed emergency boat for rescue of the beloved mannequin, Oscar. These drills are necessary so that everyone on board knows what to do in these situations. While no one hopes these emergencies will happen, knowing what to do is incredibly important for everyone’s safety. Thursday was maybe my favorite day on board. Due to the fact that there are a handful of new personnel on board, practice launching and recovering the survey launch boats was necessary. There are 4 launch boats on top of NOAA Ship Fairweather, each equipped with their own sonar equipment. These boats sit in cradles and can be lowered and raised from the sea using davits (recall the video from the “Safety First blog a few days ago). 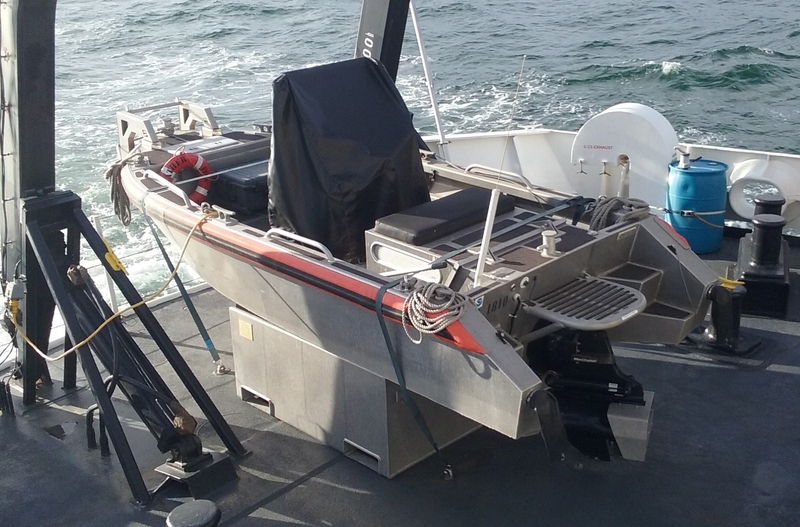 These four boats can be deployed in an area to allow for faster mapping of a region and to allow for shallower areas to be mapped, which the NOAA Ship Fairweather may not be able to access. Since this is a big operation, and one which is done frequently, practice is needed so everyone can do this safely and efficiently. 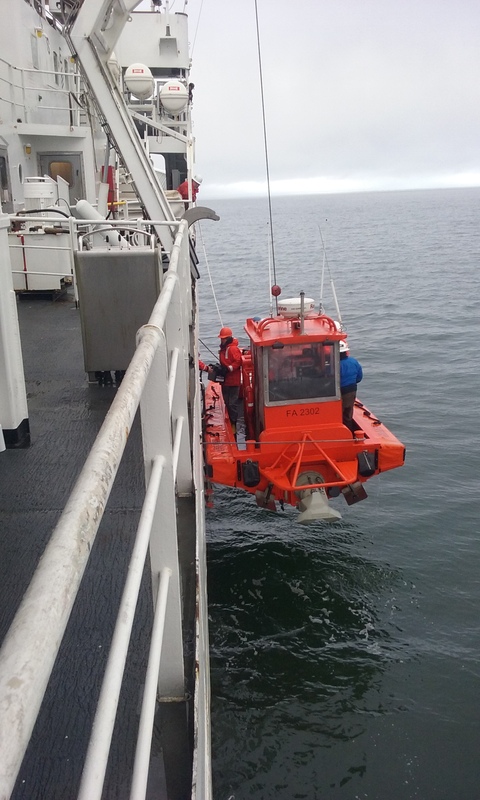 With the aid of Ali Johnson as my line coach, I got to help launch and recover two of the survey launch boats from the davits on the top of the ship into the Bering Sea. This is an important job for all personnel to learn, as it is a key part of most survey missions. Learning line handling helps to make sure the survey launches are securely held close to the ship to prevent damage and to safely allow people on and off the launch boats as they are placed in the sea. From learning how to handle the bow and aft lines, to releasing and attaching the davit hooks, and throwing lines from the launches to the ship (which I do poorly with my left hand), all is done in a specific manner. 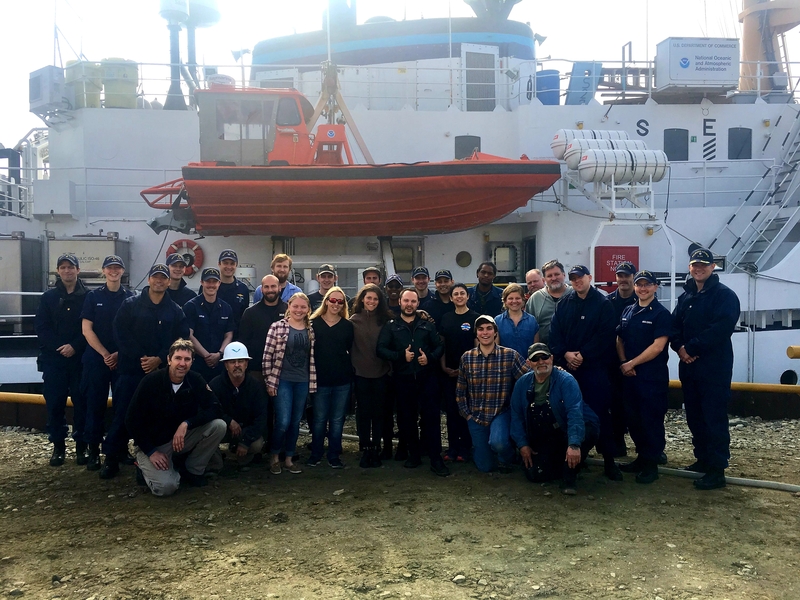 While the practice was done for the new staff on board, it was fun to be involved for the day and I got to see the beauty of the NOAA Ship Fairweather from the Bering Sea. And I truly enjoyed being on the small launch boats. I then understood what many of the officers mentioned when they told me they enjoyed the small boat work. It’s just fun! 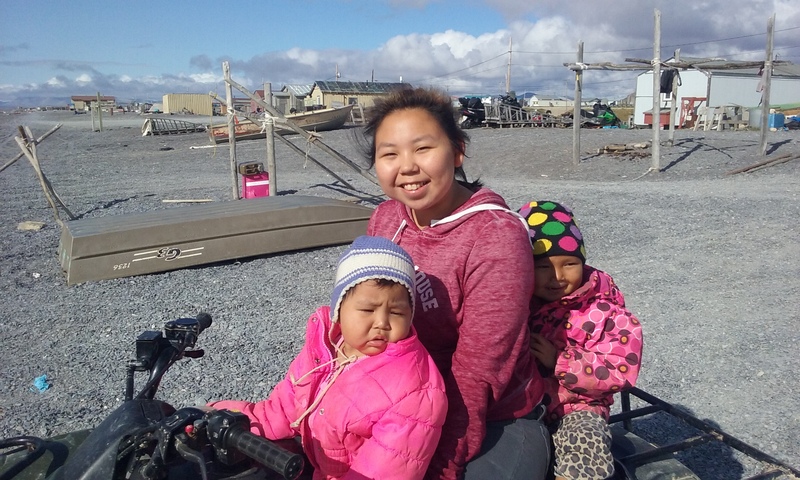 My trip ended in Nome, Alaska, which was in and of itself an experience. Students, you will see pictures later. I am extremely thankful for the crew on board NOAA Ship Fairweather, they are a wonderful mix of passionate, fun professionals. I learned so much! Being a Teacher at Sea is a strange, yet wonderful experience. Being a teacher, I normally spend the vast majority of my day at work being in charge of my classroom and beautiful students; leading lesson and activities, checking-in with those who need extra help and setting up/tearing down labs all day, as well as hopefully getting some papers graded. However during this experience, I was the student, learning from others about their expertise, experience and passions, as well as their challenges; being in charge of nothing. 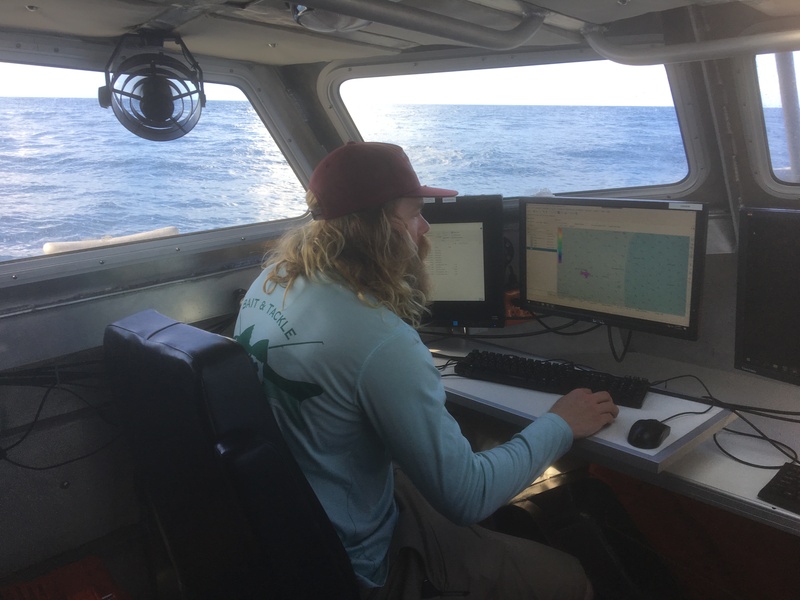 And given that I had no prior knowledge of hydrography, other than its definition, I was increasingly impressed with the level of knowledge and enthusiasm those on board had for this type of work. It drove my interest and desire to learn all I could from the crew. 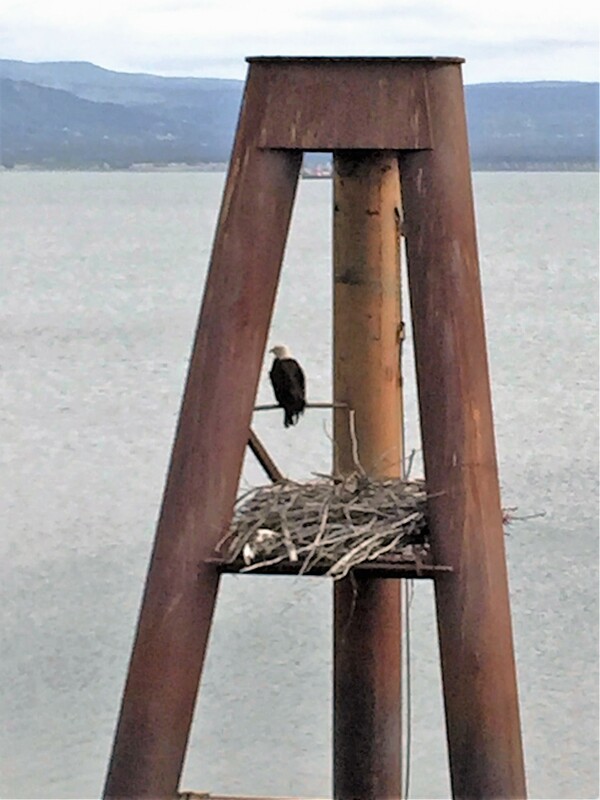 In fact, I often thought those on board were older than they were, as they are wiser beyond their years in many area of science, technology, maritime studies, NOAA Ship Fairweather specifics and Alaskan wildlife. 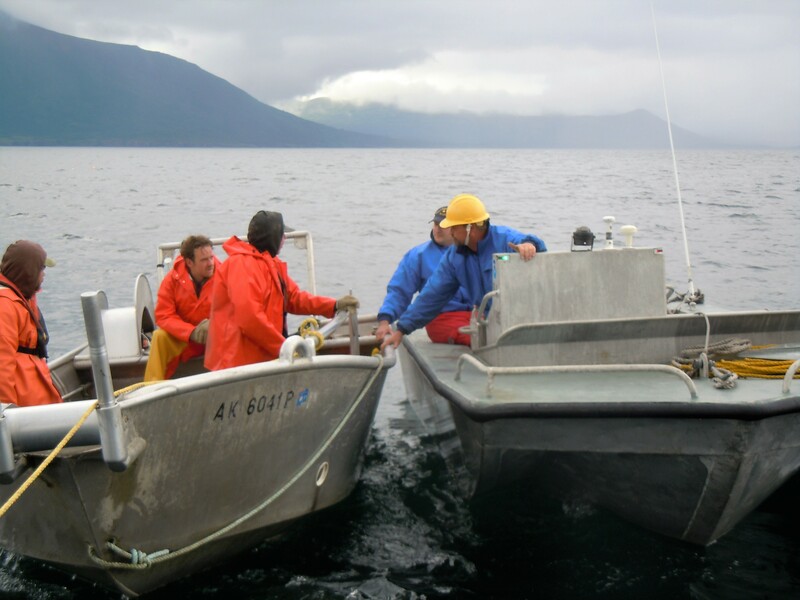 Fisheries research cruises perform biological and physical surveys to ensure sustainable fisheries and healthy marine habitats. Oceanographic research cruises perform physical science studies to increase our understanding of the world’s oceans and climate. 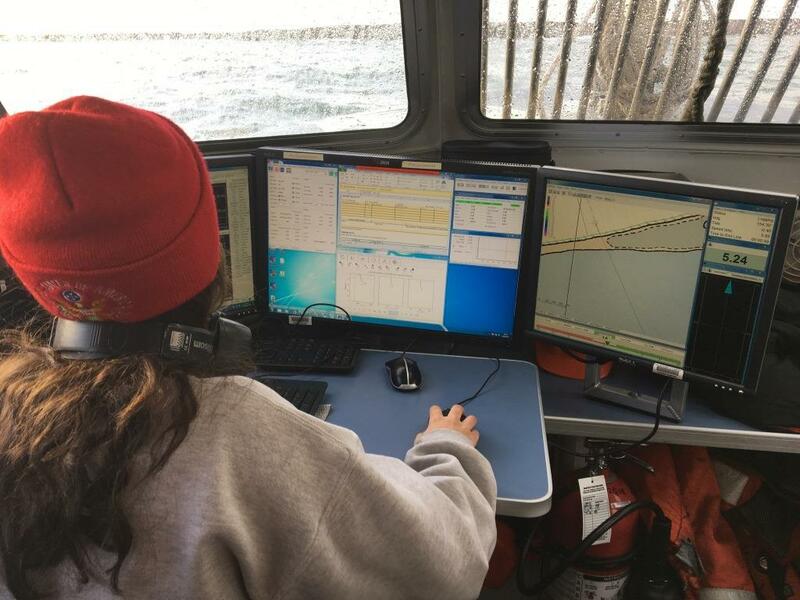 Hydrographic survey cruises scan the coastal sea floor to locate submerged obstructions and navigational hazards for the creation and update of the nation’s nautical charts. 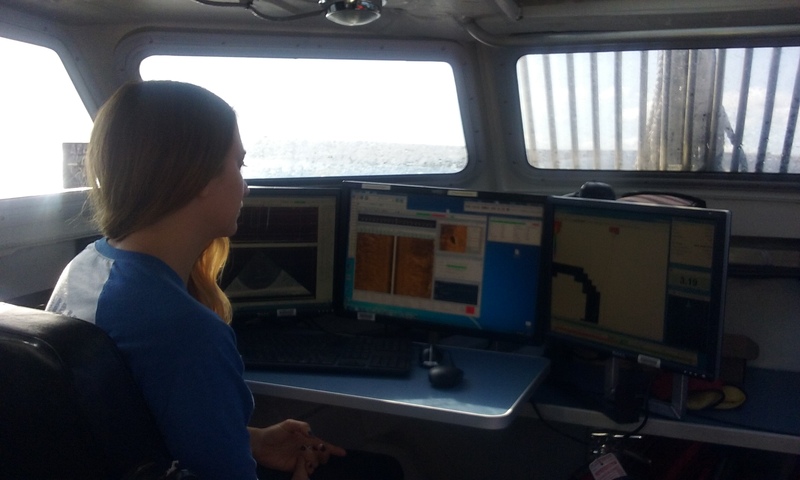 I was excited to be placed on a Hydrographic Survey boat, as this is an area in my curriculum I can develop with my students, and one which I think they are going to enjoy learning about! While I was sad to leave, and half way through had a “I wish I would have known about this type of work when I was first looking at jobs” moment (which I realize was not the goal of this fellowship or of my schools for sending me), I am super excited to both teach my students about this important work and also be a representative of this awesome opportunity for teachers. 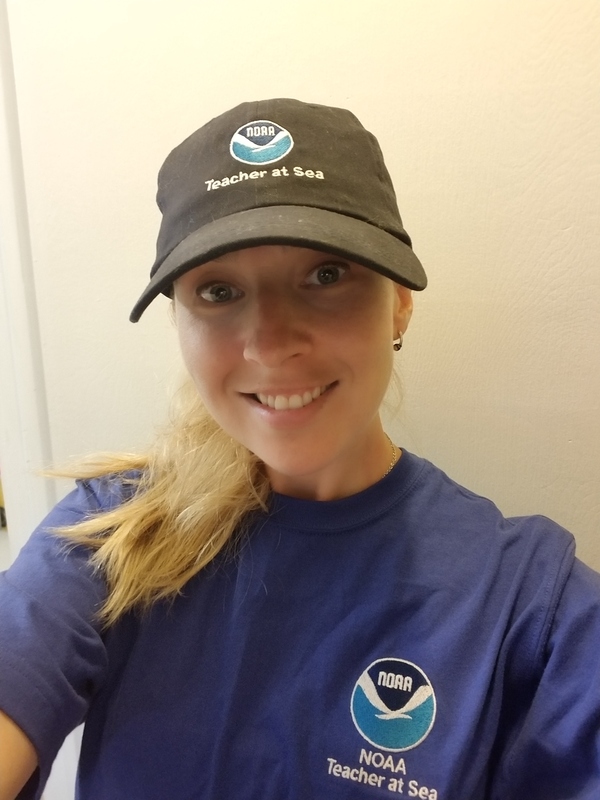 I will wear my NOAA Teacher at Sea swag with pride! Me in my awesome Teacher at Sea gear! After the morning meeting of hearing everyone’s risk assessment before getting on the launches, I was part of the four person crew on launch RA-6. 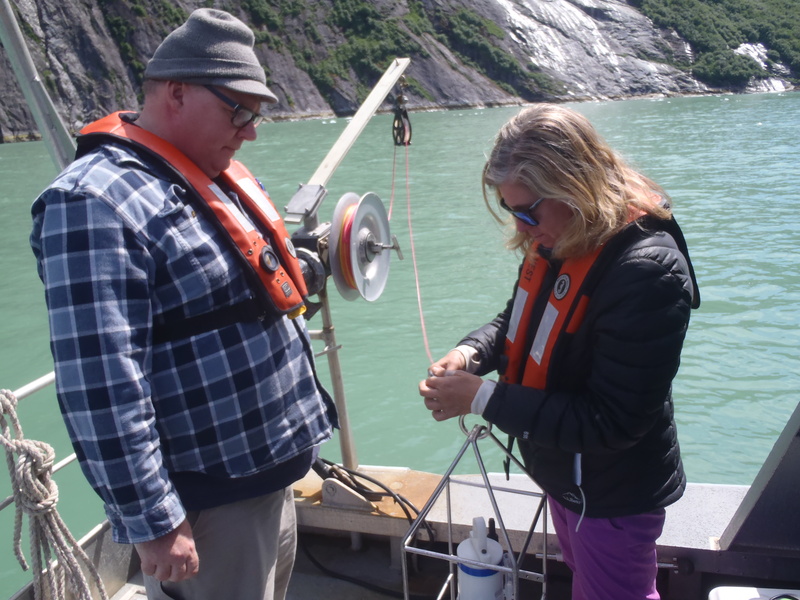 Our task for the day was to clean up the data, or collect data in places within the Tracy Arm polygon that weren’t already surveyed. We had to fill in the gaps in L and M polygons on the East point. The entire area of Tracy Arm needed to be surveyed because there are several cruise ships that are coming into this area now that Sawyer Glacier is receding and the area has not been surveyed since the late nineties. Navigation charts must be updated to ensure that the safety of the people that are visiting the area. 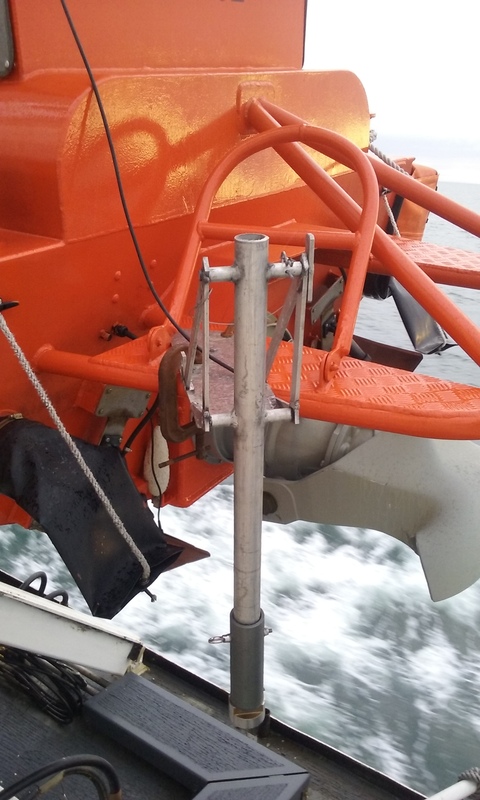 Once on the launch, the bright orange POS MV, or Positioning Orientation System Marine Vessel, must be powered to start the survey process. 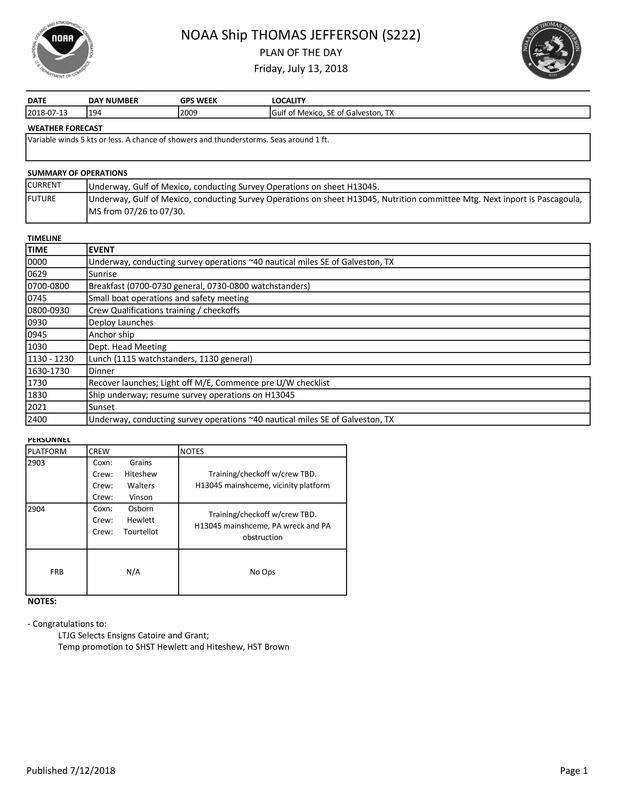 The new acquisition log was created as an excel spreadsheet to record the different casts along with the latitude and longitude, the maximum depth and the sound speed of the water at about approximately one meter. With all of the valuable data recorded, it is important to have a consistent system for managing all of the data so that it can be accessed and managed efficiently. The EM-2040 Konsberg Sonar S.I.S., Seafloor Information System, program was powered on next. The EM processing unit, which is connected to the multi-beam sonar, has three lines of information when properly communicating with sonar. The right hand monitor in the launch displays the information from the sonar. Creating the file name is another crucial way of ensuring that the data can be managed properly. It is from this computer that you can manually adjust the angle of the beam swath with the sound pings. Once the computers were started and communicating with each other, we completed a C.T.D. cast to obtain the sound speed profile of the water. 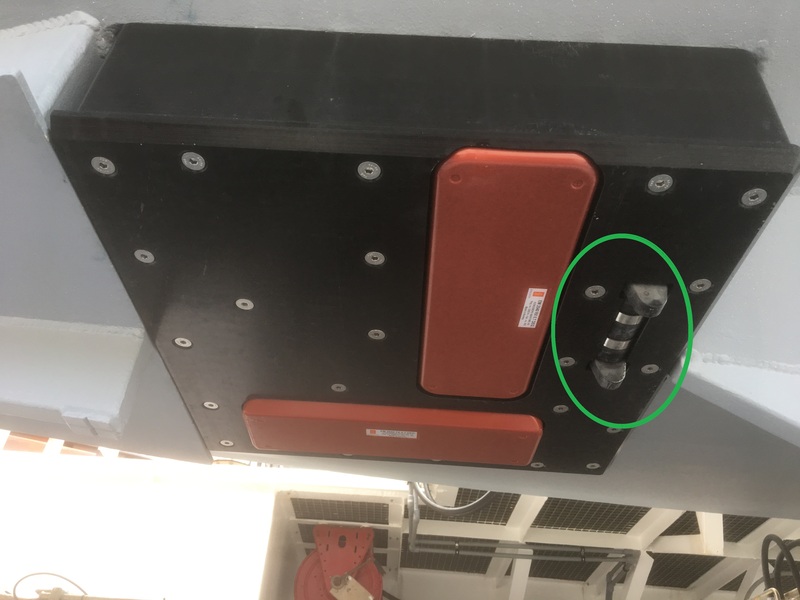 There is also a device that measures this right on the multibeam sonar, but it is important that two devices have a similar sound speed profile to ensure data accuracy. If there is a large discrepancy between the two values, then another cast must be taken. Initially, the measuring sound speed profile at the interface was 1437.2 and the C.T.D. sound speed was 1437.8. The final algorithm that determines the depth of the water will take this information into account. 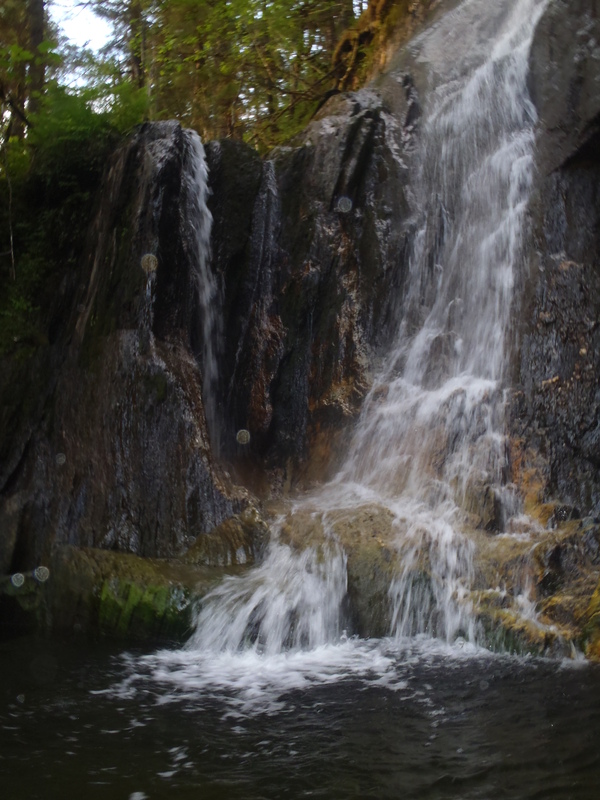 Since we were somewhat close to a waterfall, the fresh water input most likely affected the sound profile of the water. After viewing the data acquired in the sheet, or the assigned area of Tracy Arm to survey, Greg found areas where there were holes. He put a target on the map on the monitor on the left hand side computer. This HYSWEEP interface for multibeam and side scan sonar (which is a subset of HYPAC which is the multibeam software) screen shows a chart of the area with depths in fathoms and any rocks or shoals that would impede driving ability along with a red boat image of the vessel. This display is what the coxswain driving above also sees so that he or she is aware of what direction to travel. Once logging data, this screen also displays the beam so that you can ensure that all necessary data is being acquired. Previous surveys are depicted in a more subdued color so that you can see that the missing data is being collected. 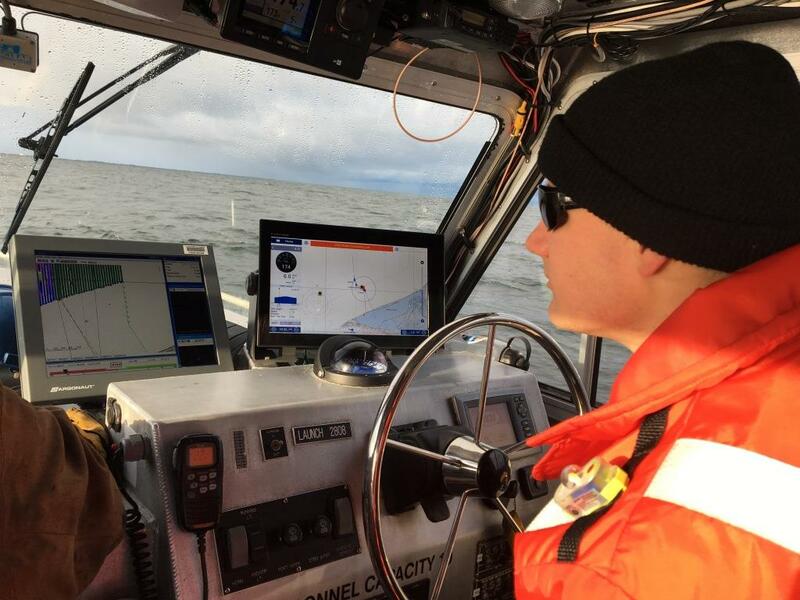 From the monitor, the survey technician must control the view of the map to be sure that it includes the targeted area, along with the path of the boat so that future obstructions can be avoided. Since we were avoiding icebergs in the initial part of the clean up, we were going at about two knots. This slow pace allows for an increase in returns, nodes and soundings that increase the data density. Shallow waters take much longer to survey due to the smaller swath width. It is important to have accurate, high resolution data for shorelines since this is the area where many vessels will be traveling. When a sonar pings, every swath, or fan-shaped area of soundings, returns five hundred soundings. Five hundred soundings times a rate of seven pings per second means there are thirty five hundred soundings per second total. This data density enhances the resolution of the maps that will be generated once the data has been processed. Since there are sometimes safety hazards when surveying there are several different approaches that can be used to ensure the entire area is surveyed in a safe manner. Half stepping included going back over previous coverage far enough away from the hazard. Scalloping is another method which involves turning right before the rock or obstruction. This sends the beam swath near the rock without putting the vessel in danger. Some areas that were too close to icebergs could not be surveyed since it was not safe. But, this hydrographic survey was able to acquire data closer to the Sawyer Glacier than ever before. Being a part of this data collection was gratifying on many levels! Seeing a white mountain goat amongst some of the most beautiful geological features that I have ever laid eyes on was another benefit of being out on the launch for the day. When a grizzly bear cub ran by a waterfall I continued to appreciate a day on the launch. Seals perched on icebergs were always a fun sight to see. And, the endless pieces of ice drifting by in the sea during our surveying never ceased to amaze me. After a day of surveying, kayaking to a waterfall in William’s Cove and exploring proved to be another fun adventure. The other day as I ran on the treadmill, I had a realization. While looking at the lifting weights, I realized that in order to build muscle, one must tear old muscles and rebuild new strands of protein. When these new fibers build on top of each other, muscles grow. I realized that new officers go through a similar process of developing skills and character. Junior officers come in with a two year responsibility where they learn an incredible amount. They are constantly put into new and challenging learning experiences where they tear their muscles. As they acclimate to these experiences, they build character, or muscle. The cycle repeats with subsequent occurrences. Junior Officer ENS Airlie Pickett has a small triangle tattooed on her inner left bicep. When I asked her the significance of it, she said that the only way that you can truly understand something is to observe how it changes. In math, integrals and derivatives explain this change. As I appreciated her tattoo, I considered that she must learn quite a lot about herself as a junior officer constantly learning new things. I’ve appreciated the opportunity to experience and observe myself in an unfamiliar surrounding on Rainier. It’s humbling to not understand the nautical terms, endless acronyms of surveying and NOAA Corps structure of life. I appreciated that all hands on Rainier made me feel welcomed, and were patient with explaining new concepts to me. 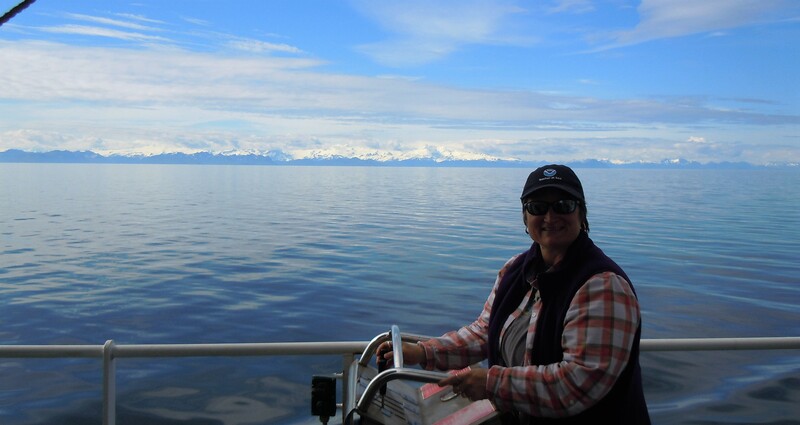 I am grateful for the opportunity to experience the Inside Passage while learning about hydrographic surveying. Living on a ship, learning about navigation and meeting all of the hard working people on Rainier has been an unique experience. Overall, this has been an incredible opportunity. Mahalo nui loa! (Thank you very much). A hui hou Rainier! (Until we meet again)! Barometers measure atmospheric pressure in millimeters of mercury or atmospheres. An atmosphere is the amount of air wrapped around the Earth and one atmosphere, atm, is the amount of pressure at sea level at fifteen degrees Celsius. As altitude increases, the amount of pressure decreases since the density of the air decreases and less pressure is exerted. A decrease in altitude increases the amount of pressure exerted and the density of the air increases. Changes in pressure can signify weather patterns. A drop in barometric pressure means a low pressure system is coming in and there is not enough force to blow away the weather. Weather indicative of this includes windy, cloudy and/or rainy weather. An increase in barometric pressure means a high pressure system is coming in and cool, dry air pushes out the weather resulting in clear skies. Weather from the Bridge: extremely variable today!! I went out with the team on the Ambar. As is the case with all the small launches, the Ambar is brought down from the boat deck to the breezeway deck for loading before the actual release. Ambar jet boat at the breezeway deck, loading supplies. You can see parts of the davit where it was previously cradled on the boat deck above. All gear, materials, food (long days out there!!) and people embark prior to the final drop to the water and the actual launch. This takes a team of a dozen or so people working in coordination. Prior to the start of launch, a safety officer is required on deck to oversee the process. This might be the CO (Commanding Officer), XO (Executive Officer) or Operations Officer. Most of the other personnel involved are a part of the deck crew, including the coxswain (who drives the small launches). 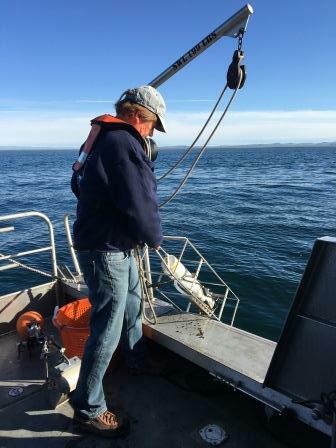 A davit operator handles the control of the boat via cable(s) all the way down. The bosun (boatswain) on the breezeway deck is directing commands to the operator using hand signals. Several hands are securing the craft with ropes against the side of the ship. All of these moves have to happen in perfect coordination for the safety of everyone and the protection of the Ambar and Fairweather. Personal protective equipment is worn by all parties throughout. This includes a flotation vest or jacket and a hard hat which you can see on those on the boat in the image to the left. Five of the other six small launches on the Fairweather undergo a similar process. Each is housed in a davit cradle and each has one or more cables to control the craft during its descent toward the waterline. 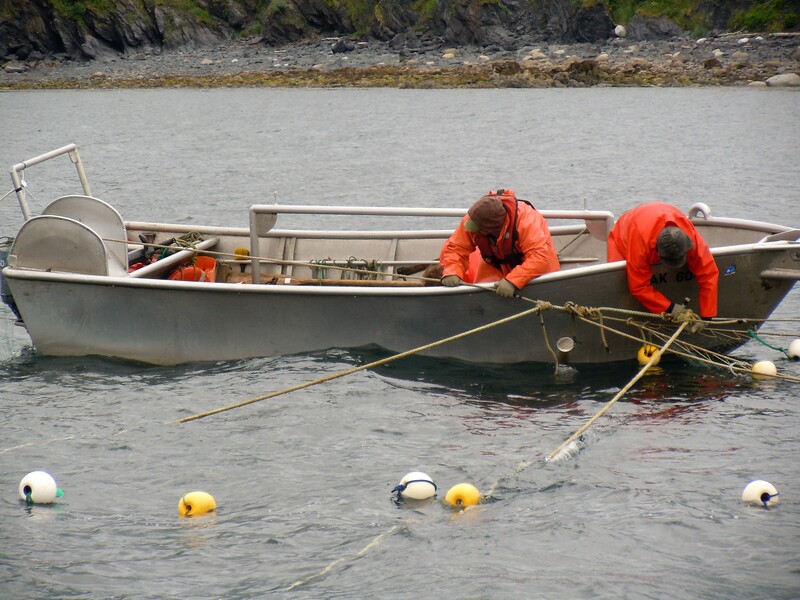 The davits all shift their cradling position while the cables lift to assist in the release of the craft. Once the craft is entirely free of the cradle, it is slowly lowered down the side of the vessel to the breezeway deck for loading as described above. One boat, though, has a really cool option. This is the FRB or Fast Rescue Boat. This craft can actually be launched by the driver, which is a requirement of any FRB. Workboat on the fantail – note the three lines attached, two at the stern and one at the bow. These are handled expertly by the deck crew during launch to keep her true. The final craft is a workboat which is housed on the fantail. It is not used for surveying, but will often be employed as passenger transport. It is also used for pick up and drop off of material that may be used on land, such as the HorCon station discussed in my previous post. This craft is not seated in a davit cradle and is instead launched through the use of a very large crane (see image below). The crane is attached to the launch at a center point connected with three lines. Crane on the Fairweather boat deck centered between four small launch davits. The craft is moved from the position on the fantail to either the port or starboard side level with the deck and lowered to the water before loading. For this reason, it is much more difficult to keep it completely horizontal and not hitting the deck and doing damage to the Fairweather. So back to the Ambar and what we were actually doing in Grantley Harbor. Much of the harbor is quite shallow and when a team had been in there previously, they felt that there may be some irregularity to the otherwise uniform seafloor. They had been getting some interference and scattering on the side scan. They wanted to understand why and also to get a complete picture of the harbor seafloor. 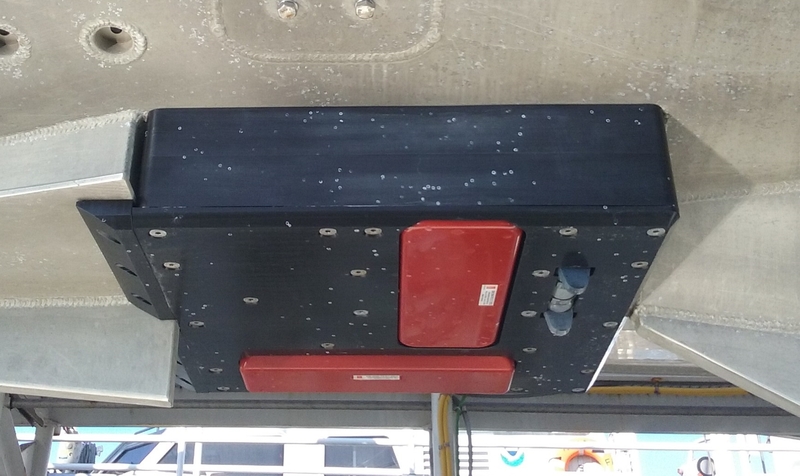 With the Ambar and the single beam sonar, there is little to no danger of doing damage in extreme shallows since the equipment is not on the underside of the boat and the Ambar itself can be beached as there are no propellers. 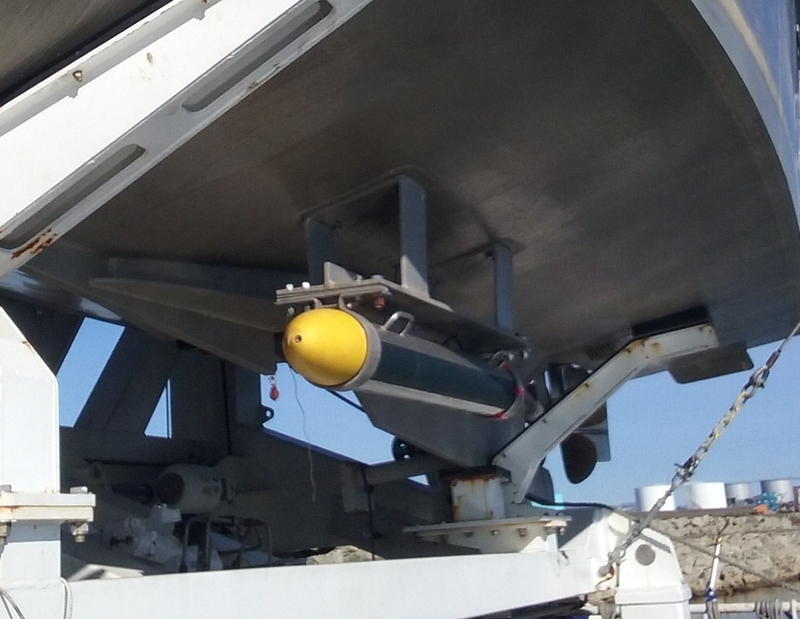 Single beam sonar in its mount on the stern of the Ambar. It is in the down position as it will be when launched tomorrow. We took the boat into the shallows with the single beam sonar to take measurements along lines to as shallow as 2m. While surveying in the shallows, we found that there were sea grasses growing and according to the Operations Officer who was on board, that may have been the reason for the interference. Regardless, we continued to survey a regular pattern in order to have good data for future charts. During this time, I was given the opportunity to drive the Ambar… which showed me how much more difficult staying a straight line course is than the coxswains make it look. Yep. The outlined line is my line. I am reasonably proud that I actually manage to make it from one side to another. But even that was with a WHOLE lot of coaching!! Upon return to the Fairweather, the Ambar is reattached to the cable and brought back up to the breezeway deck. Ropes are again used in coordination to keep the boat steady as it is lifted, much the reverse of what was described above. At that point all materials are unloaded and all the people disembark. The Ambar is then hoisted back up into the davit cradle. Shipboard life on a NOAA vessel is quite different from life on land. First, because the ship is a twenty four hour operation, people are needed at all hours. Many of the positions on NOAA vessels run on a 4 hours on, 8 hours off cycle. Some positions have recently shifted to 4 on, 4 off, 4 on, 12 off to afford greater lengths of time for sleep. When you are on the lower decks, it is also easy to lose track of time – and of course when you’re in Alaska during summer, it’s still light out at 10 o’clock. 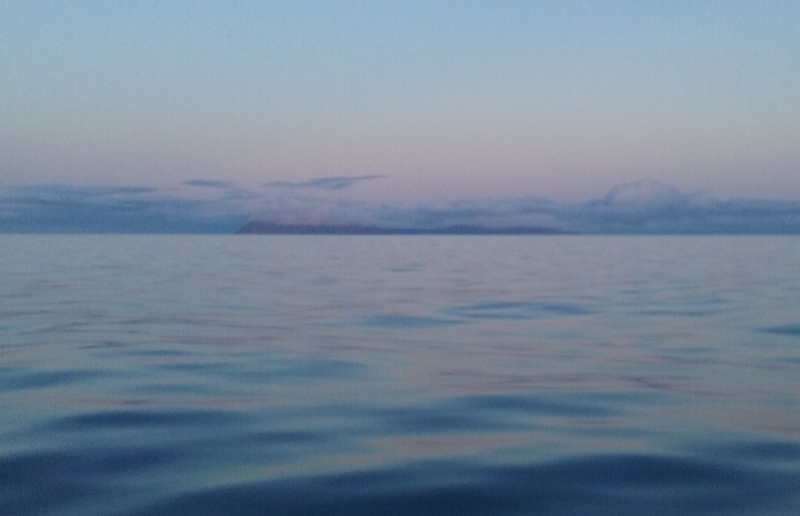 There are auroras to potentially be seen in the wee hours and multibeam surveying that happens through the night. There are always people up and about doing things – so the ship is a busy place at all times. And with this in mind, I have to admit I have not been doing a great job getting to sleep. But I do sleep well on the ship, the rocking is the best cure for insomnia I’ve ever experienced. And I have been eating incredibly well – and I mean INCREDIBLY well. Mealtimes are the same each day, so that’s a great help. I will talk more about the food and the kitchen in a future post. Fortunately, with all that good eating, there’s a gym on board, so I’ve been able to work some of it off. There’s also laundry on board and a lounge with lots of movies. I like it. And waking up to the ocean and a lovely sunrise each morning makes the tiredness not really matter much. Light early in the eastern sky – the sun comes up all around you this far north. It’s truly lovely. As a part of NOAA’s mission, we had the opportunity to go ashore at a small town at Port Clarence called Brevig Mission. It is a town of almost 400, most of whom are native to Alaska. While ashore, we were able to spend time talking with the people, purchasing some of their handcrafts and fish, and even visiting the school. The people live simple lives. 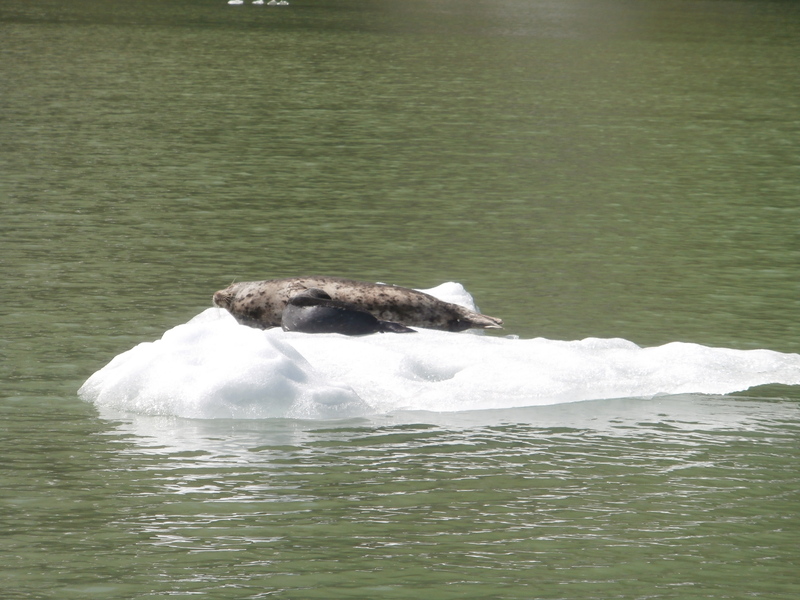 They still hunt walrus, seal and whale and those foods are the staple of their diet through the frozen winter months. I found it fascinating that they use all of the parts of the animals – the items that I purchased were from seal and walrus. 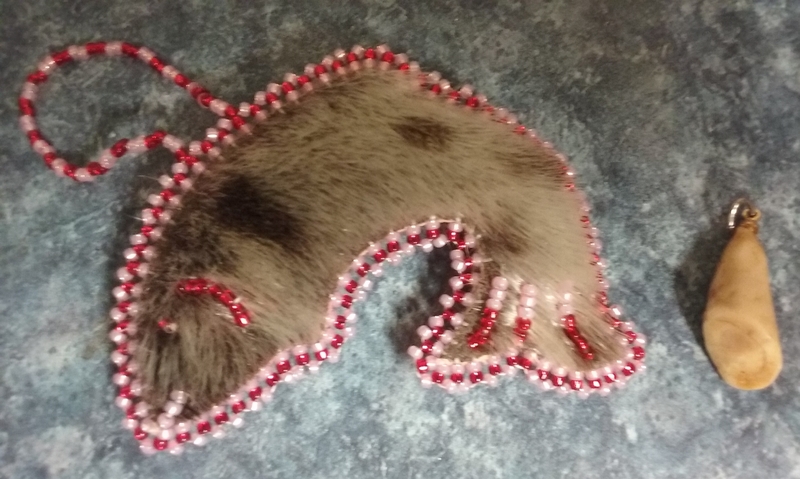 On the left is an ornament made of seal fur and on the right is a pendant of walrus tusk. Mom with her two little girls down near the water on their ATV. This is the most common form of transport around Brevig Mission. This cross memorializes all of the residents of Brevig Mission who died in the 1918 flu. It now lays on the ground aside the mass grave. All of the names and ages of the victims are listed. Brevig Mission was hit hard by the 1918 Spanish Flu, perhaps in percentage mortality, the hardest hit place in the world. Of the 80 residents of Brevig Mission, 72 succumbed to the flu and died in a 5 day period. It was absolutely devastating. One of the current residents shared with me that reaching 400 is encouraging to the town and everyone there believes that the town is continuing to grow. This is the location of the mass grave from the 72 flu victims of the 1918 Spanish Flu. It is a sobering place. Over the past two days I have been introduced to tremendous amounts of the science of hydrography. In this blog post I will focus on the hardware used and the process of surveying. There are two types of sonar that are being employed. The first is side scan sonar and the second is multibeam sonar. Side scan is shorter range and performs better in shallower water. Side scan is used in conjunction with multibeam, however, as side scan does not give true depth values. The function of side scan is to show features evident on the ocean floor. For this reason, multibeam is run in conjunction with side scan in order to keep an accurate record of depths. Multibeam shows an exact depth. Due to the fact that it is an angular spreading band from the center of the underside of the launch, at shallow depths it will only show a very narrow strip of ocean floor. Stop and imagine…a lit flashlight shining on a wall from only a few centimeters away. What happens to the image on the wall as you pull the flashlight back? The area of coverage of the image will become larger. The concept is similar for the multibeam in shallow versus deeper water. Using multibeam in shallow water then would create a need for more passes closer together in order to cover an area. There are instances where using this technology even in shallow water would make sense, but for a full coverage survey, this would not be the case. The third piece of hardware used for the standard small boat launch hydrographic surveys is the CTD device. The CTD will measure conductivity of the water and also give both a temperature and density profile. The CTD is deployed multiple times during a survey as a tool to calibrate the data that is coming in via the sonar. Conductivity of the water gives an estimate of the total dissolved solids in the water. This information, along with the temperature and density will give an estimate of sound speed through the water column. Stop and try this one for better understanding… knock on a door normally with your head roughly arm’s distance from the point where you are knocking. Now repeat the process of knocking, but with your ear pressed against the door approximately an arm’s length away from the knock. What is different? You should have noticed that a more precise (and typically louder) sound reached your ear. If you pay close attention, you will also notice that the sound reaches your ear more quickly. This is roughly analogous to how changes in the water column will affect sound speed. The final piece of equipment used regularly for surveys is a HorCon (horizontal control) station. This is a land-based station that will help to define accurate position in the water. It allows for greater precision with global positioning data. The signals of satellites responsible for global position are affected daily by changing atmospheric conditions. Moreover, the precise positions of the satellites themselves are actually not well known in advance. This may result in a GPS location moving a few centimeters in one direction or another. While this is not going to heavily impact your ability to find a Starbucks in a strip mall, it can have a definite impact on the accuracy of charts for navigation. The HorCon station always remains in the same place on land, and can therefore be used to calibrate the measurements being read in the survey waters nearby and that information can be used along with corrected satellite positions since it is coming after the fact. 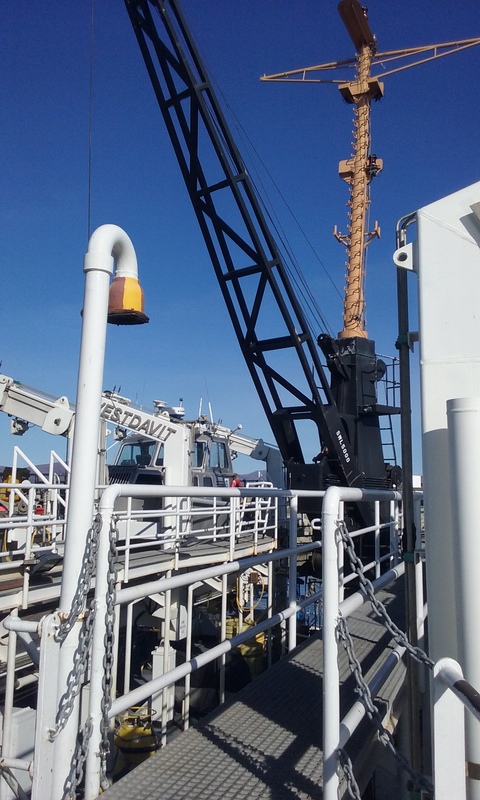 Today we worked in Port Clarence, Alaska, both outside and inside of Grantley Harbor. Most of the depths being surveyed are in the 4-6 meter range. The particular area being surveyed had been previously surveyed in the 1950s by the US Coast and Geodetic Survey, likely using a single beam sonar system. The current survey is intended to note changes that have occurred since that prior survey and to accurately update all of the charts. 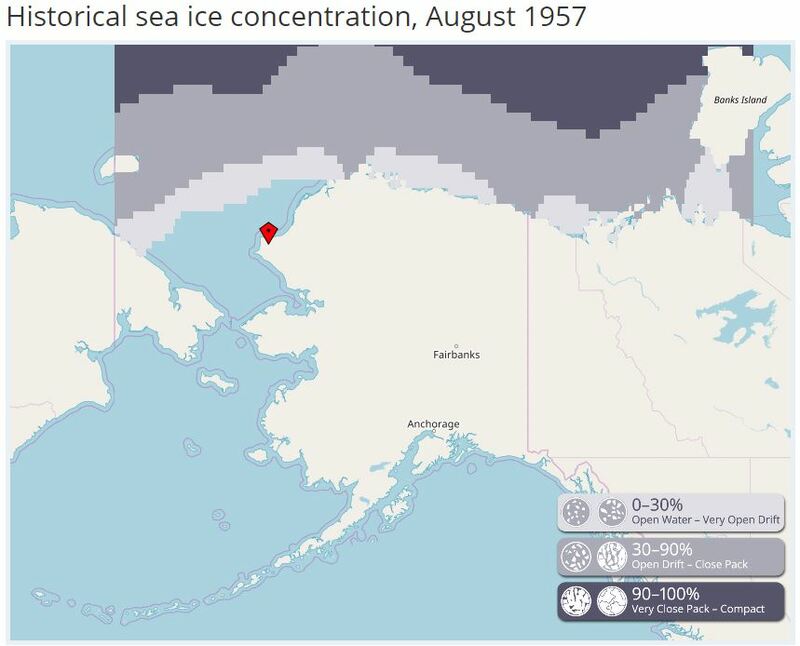 The area of western Alaska is expected to increase in boat traffic over the coming years due to the opening of the Northwest Passage from the Pacific to the Atlantic via the Arctic. This route is significantly shorter for most shipping traffic than the route through the Panama Canal. Because of this expected increase in traffic, there is a need to identify areas for sheltering during heavy seas. Port Clarence is a natural inlet that offers some protection and holds potential for this purpose. Two launches were deployed. I was on launch 2808, the second described here. The first was equipped with only multibeam sonar and the second had both multibeam and side scan. The plans for the two launches were different. The launch with only multibeam was working in an area of Grantley Harbor and covering an area that had previously been mapped to insure that the values were acceptably accurate. This focus existed primarily because of extra time available up in this area. The launch running the side scan was completing some unfinished work in Port Clarence and then did further work inside of Grantley Harbor. These areas, or “sheets” are described below. As a side note, small boat deployment is a fascinating and involved activity that I will discuss in a later blog. Survey areas are broken up into sections known as “sheets” – each sheet has a manager. This person will be from either the NOAA Corps or a civilian member of the scientific survey team. 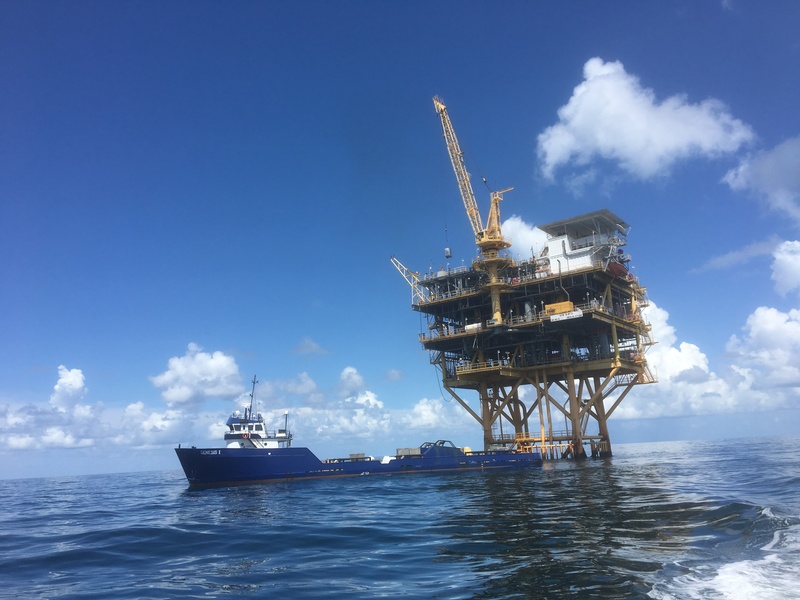 The sheet manager will be responsible for setting up the plan for survey and doing all of the final checks after data has been gathered, cleaned and examined to determine if there are areas that should be rechecked or run again before it is completed and undergoes final processing. A sheet manager will need to consider several questions prior to setting up the initial parameters for the survey. What is the depth being surveyed? What type of bottom is it? What type of coverage is needed? All of these factors will come into play when determining how the lines will be run – how long, how far apart, which sonar type, etc. Once the plan is determined, it will be the job of the Operations Officer, LT Damian Manda, to parse out the duties and create a daily work plan to cover all of the areas. Each day, multiple launches will be sent out to gather data as described above. As the fieldwork finishes for the day, data will be transferred to a drive and then brought into the ship’s mapping room where night processers will begin the lengthy work of checking and cleaning the data so that it can all be ready for the final processing step prior to being sent to the client. How good are those data? There are several checks built into the data collection process. First, the survey team members on the launches are watching in real time. 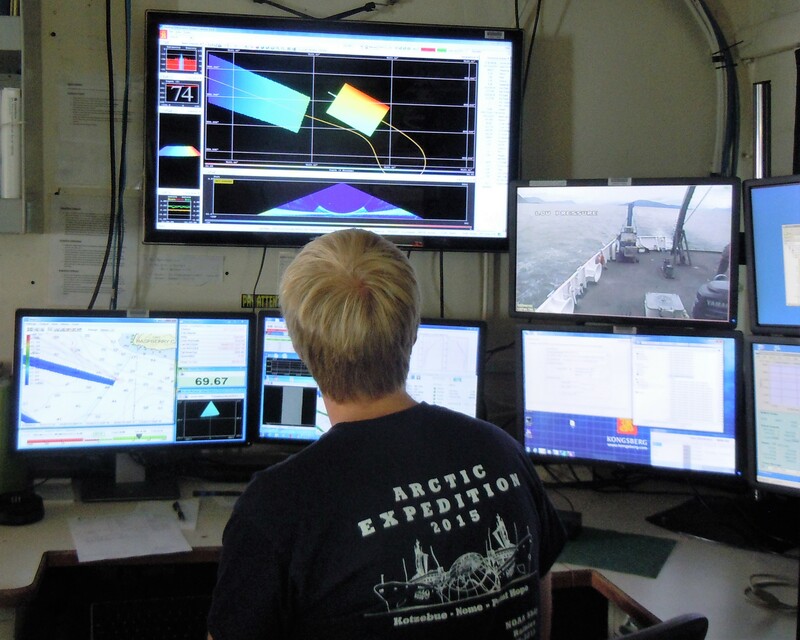 With three screens to work from, they are able to see what the sonars are seeing and can also set certain limits for the data that will alarm when something appears to be contrary to what’s expected. Night processors look for anomalies in the data like sudden inexplicable drops in depth in an otherwise flat surface or an extremely “noisy” area with little good data. Any area with a former survey will also be compared to the previous values with large differences signaling possible issues. Many trained eyes look at the data before it is accepted for charting and there will commonly be at least one return to an area to check and recheck prior to completion. One area in the current survey has continued to show odd results, so trained NOAA divers will dive the area to find out what is really going on. So far this has been an amazing experience. I fully enjoy being among the crew of the Fairweather and living on the ship. It’s hard to say what my favorite part has been so far because I have honestly enjoyed all of it! Since we didn’t get underway until Monday, I had the opportunity on Sunday to roam around Nome with a couple of the other folks that are just here for two weeks, LT Joe Phillips and LCDR Ryan Toliver. I learned a lot more about both the NOAA Corps and the Public Health Service of which they are respectively a part. (These are two of the seven uniformed services – can you name the other five?) NOAA Corps officers are in command on all of the active NOAA commissioned ships and aircraft and you will learn a lot more about them in future posts. The PHS is an organization made up primarily of medical professionals. These folks serve in various medical and medical research positions around the nation. There are many who will work for the National Institutes of Health in research, or the Bureau of Prisons or commissioned vessels like Fairweather as practitioners. Unlike NOAA Corps, PHS is not on a billet cycle where every two to three years you will be moved to a new position in a different office or location. Similar to all of the other uniformed services, though, promotion through the ranks is both encouraged and desired. 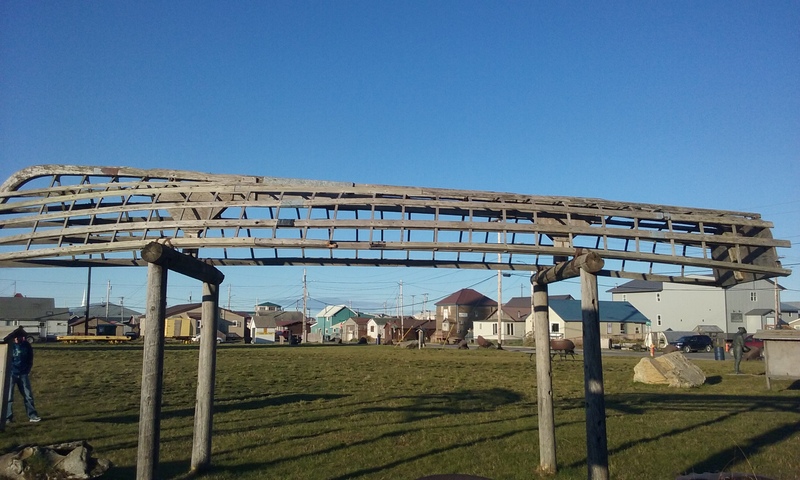 As we walked all around Nome, this was one of the sights – the frame of a traditional fishing boat. We also saw the marker for the end of the Iditarod race. 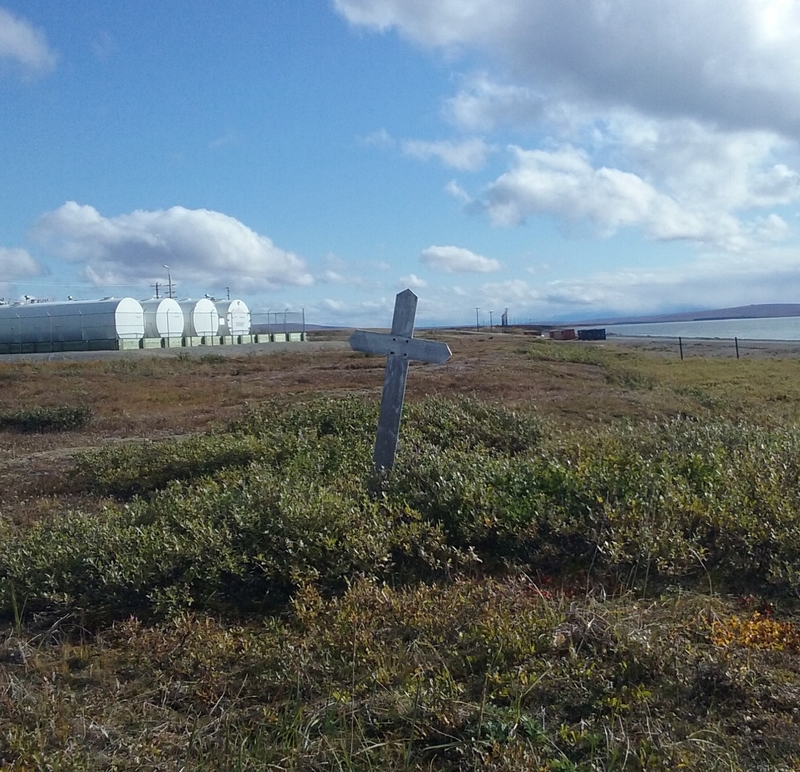 I was able to see the historic beginning in Seward, Alaska back in 2010, so seeing the end in Nome was an unexpected treat. Nome also has Cold War-era missile early warning system arrays at the top of a mountain nearby. We had a chance to hike around them and see some of the interesting geologic features of the area. There’s so much more to talk about, but I think I’ll stop here and save shipboard life for my next post. … that the Iditarod has its historic beginnings with the Public Health Service? 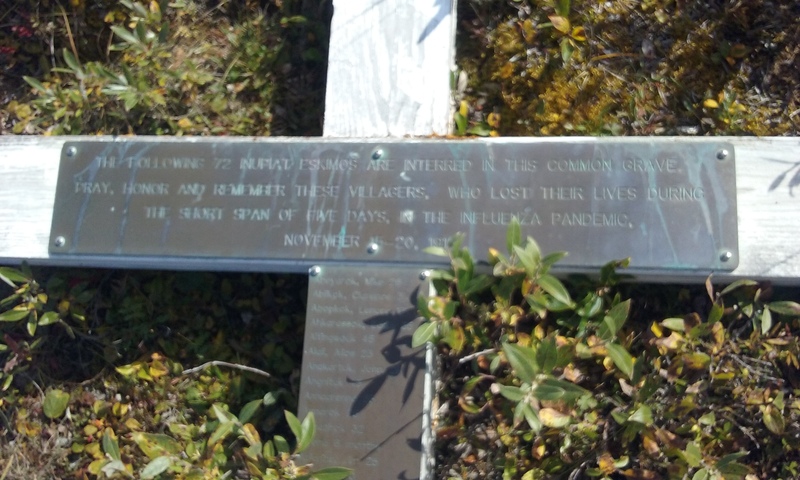 There were many children in interior and western Alaska dying of diphtheria in the early 1920s. When it reached epidemic proportions, the only doctor in Nome reached out to the PHS in the lower 48 to ask for help. Vials of serum were found and sent north to Seward, but then because of heavy ice and storming, dog sled teams were used to get the vials to the interior towns and to Nome. The original race along the Iditarod Trail was run as a memorial to the “Serum Run” and eventually evolved into the highly competitive race it is today.